Isn’t this your year to visit the Holy Land? Come and travel with Scot and Maurine Proctor on an unforgettable journey that will make the scriptures come alive. This is a unique tour you may not have seen offered before because in addition to seeing all the inspirational and historic sites you would want to see on a visit to the Holy Land, we are taking you to some places we find fun and unforgettable–places that most tour groups don’t get to go. After so much time in the Holy Land, we found some things we think are “not-to-be-missed” that most miss. Please consider adding the exciting Egypt Pre-Tour to your adventure. This year’s special package is April 6-14 and includes a Nile River Cruise! Egypt is one of the most unique places on earth. You may ask our agent about the Egypt pre-tour–the cost is $2149 per person). We will have with us the number one tour guide in all of Egypt. About half of our tour participants each year do the Egypt add-on. This year we are expecting more. Please CLICK HERE for all the details on the very exciting Egypt Tour. Israel is truly the Lord’s visual aid and visiting will open your eyes to the scriptures in completely new ways. In ancient times Amman, Jordan was one of the cities of the Decapolis known as Philadelphia. April 13-14 – Day 1 & 2 – Friday/Saturday Trans-Atlantic flight to Amman, Jordan. Arrive at our lovely hotel and receive a welcome and attend our group orientation. You will so love getting a good night’s rest tonight! We get to see some amazing things in Petra. You have free time here after a guided orientation for an hour–some of our participants will explore anywhere from 6 – 10 miles of this ancient city. April 15 – Day 3 – Sunday Traveling south from Amman we stop at Mt. Nebo where, like Moses, we get a sweeping view across the Jordan Valley and the Dead Sea to the Promised Land. Then we spend the day in Petra, one of the new Seven Wonders of the World, where the Nabataeans carved magnificent buildings out of red sandstone, (you’ve seen it in the Indiana Jones and the Last Crusade movie). We will walk through an immense crack in the stone along a pathway that will take you to Petra’s most impressive monument—the Treasury. You walk along the Street of Facades, see the Royal Tombs and more. We will talk about how the ancient prophets anticipated the coming of the Messiah. That night we dine and stay in the Seven Wonders Bedouin Camp where red cliffs soar and the stars shine. We eat and dance around the fire and feel a little like both Nephi and the Children of Israel. Everyone loves this experience. This is truly unforgettable. The Martian was filmed here as was Lawrence of Arabia. This is one of the most stunning landscapes on planet earth. You will love it–up front and personal! April 16- Day 4 – Monday – Drive to Wadi Rum, associated with Lawrence of Arabia, where we will four-wheel out into the desert to see one of the most impressive desert landscapes in the world. The scenery here is almost beyond imagination! If you didn’t go to Egypt, this is your chance to ride a camel. We then cross the border into Israel at Eilat and begin our journey north towards the Dead Sea. Later this afternoon we float in the Dead Sea and demonstrate how you can do perfect water ballet without sinking! We stay this evening at a wonderful hotel in Ein Bokek not far from Masada. Being at the top of Masada soon after sunrise is exhilarating! The view from the top is reward enough–but there’s more! April 17 – Day 5 – Tuesday – Tour of Remarkable Masada Masada was one of Herod’s grand palaces, but also the last stand of the Jewish resistance when they were overrun by the Romans in 73 AD. We visit Qumran where the Dead Sea Scrolls were discovered, then drive through the wilderness of Judea to Jesus’s baptismal site on the Jordan River then past Jericho and the Mt. of Temptation. This afternoon we are reminded how the Romans lived during Jesus’ time as we visit the amazing site of Beit Shean, an impressive Roman city, which was one of the Decapolis where Christ’s apostles preached. Stay tonight by the Sea of Galilee at the unforgettable resort, Ein Gev. This is a place where you can be assured you are walking where Jesus once walked. We go on a trail that was once the path from the Galilee to Nazareth, one Jesus walked many, many times. April 18- Day 6 – Wednesday – Today we walk where Jesus walked in the Valley of the Doves, followed by a visit to the Mt. of Beatitudes where He gave his Sermon on the Mount and you will be able to see how he could address so many people at once. This is always one of the highlights of the tour. Then it is on to Banias, a place of natural beauty with a beautiful, cascading waterfall. We come to the origins of the Jordan River. This is also the site of Caesarea Philippi, where Peter declared that Christ was the “Son of the living God.” We will also see Mt. Hermon, a candidate for the Mt. of Transfiguration. Stay again tonight at Ein Gev. Everyone loves to sail on the Sea of Galilee. Today we truly sail where Jesus walked. April 19 – Day 7 – Thursday – In first light we sail today where Jesus walked on the Sea of Galilee. We stop by the Boat Museum, to see a boat that was discovered from the time of Jesus. We next visit the newly excavated ruins of Magdala where Mary Magdalene called home. Then it is on to the town where Peter lived and where Jesus ministered for three years, Capernaum. Here Christ performed so many miracles and taught in the synagogue. You can close your eyes and almost be in the scene at the healing of the daughter of Jairus. At St. Peter’s Primacy on the Galilee we remember both the miracle of the loaves and the fishes and also the resurrected Jesus preparing fish on the seashore for his hungry apostles. We will eat St. Peter’s fish today. Late this afternoon, we will go to the top of the Mt. Arbel, overlooking the Galilee for the best view in the region, a place so beautiful we made it the cover of one of our books. Stay again tonight at beautiful Ein Gev. You will meet some amazing people at Nazareth Village who are dressed in first century garb and who talk to us about things in Jesus’ day. You’ll love this place. April 20 – Day 8 – Friday – We are on to Nazareth today, first to Mt. Precipice overlooking the Jezreel Valley. When the people of Nazareth rejected the Savior, this is where they tried to kill him. Below is also the scene of the last battle of Armageddon and to the east Mt. Tabor, another candidate for the Mt of Transfiguration. Then it is on to one of our favorite stops, Nazareth Village where you see what Nazareth would have looked like in the time of Christ, including villagers and shepherds who are dressed up as in the period to enhance the scene. We also partake of a 1st century meal here that you will love. Next, we go to Caesarea Maritima, which was once a grand Roman city with a beautiful aqueduct that is still standing. It is also the site of Paul’s trial before King Agrippa. Tonight we visit Jerusalem’s Western Wall and see how the Jews celebrate Shabbat. We stay tonight (and for the next four nights) in Jerusalem. Stay at the Olive Tree Hotel. We even visit a cave in Bethlehem’s hills–a cave that has been used as a fold for animals. Here you will get the sense of how it really was at the birth of Jesus. April 21 – Day 9 – Saturday –Shabbat Shalom. Today we attend sacrament meeting at the unforgettable BYU Jerusalem Center. We will arrive early to see the magnificent views from the center. Following this, we will head to a wonderful lunch in Bethlehem’s Tent Restaurant. Then we see Shepherd’s Fields, where we celebrate Christmas once again. Next we visit the Church of the Nativity, which has been standing since 330 AD over a cave where many believe Christ was born. Tonight, when Shabbat is over, we visit Jimmy’s Olive wood shop to look for beautiful treasures. Stay at the Olive Tree Hotel. You will see a model of Jerusalem at the time of Christ. We will study this together and get you oriented to this holy city. April 22 – Day 10 – Sunday – Arise early because we are going to the Temple Mount, a sacred place to Jews, Muslims and Christians, a place some believe is the very origin of creation. We will see the Dome of the Rock, Al Aqsa mosque and more. Then we go to the Pool of Bethesda, where Christ healed a paralytic man and to St. Anne’s Church where the acoustics make us all sound like angels when we sing. We will stop at Pilate’s Judgment Hall, Chapel of Flagellation and show you where Antonia’s Fortress was that housed the Roman soldiers who scourged Christ. We then follow the Via Dolorosa (the way of the Cross) to the Church of the Holy Sepulchre, the site believed by many Christians to be where Christ was crucified and resurrected. This afternoon we visit Yad Vashem, the vivid Holocaust museum, followed by a visit to the Dead Sea Scrolls Museum, and the Second Temple Model of Jerusalem. This gives you a picture of what Jerusalem once looked like and helps you understand today’s layout. Olive Tree Hotel. Our tour participants in 2016 actually found 4 ancient coins in our sifting together. This was so exciting! April 23 – Day 11 –Monday – Antiquities Day! This is a favorite since you will do things you would otherwise never get to do. We begin on Mt. Scopus, just below the BYU Jerusalem Center, working with archaeologists to sift some layers of material that came from the Temple Mount looking for shards, pottery, coins etc. You will feel like an explorer and a treasure hunter all at once. Many of our tour participants have found amazing things over the years. Next we go to the City of David, the most ancient area of Jerusalem. We will walk through Hezekiah’s tunnel, an amazing adventure, one of the most outstanding engineering feats of the ancient world. Then we head to the Archaeological Park that is part of the temple complex where you will learn about the temple Jesus knew and walked on the very steps he walked on that once led into the temple. Finally, Joseph Zanbil, an antiquities dealer will teach us about the antiquities of Israel—how he has found them and what they are. This afternoon you’ll have free time to explore the Old City on your own. Stay again at the Olive Tree Hotel. A visit to the Garden Tomb is a highlight of the trip. This is why you came to the Holy Land. 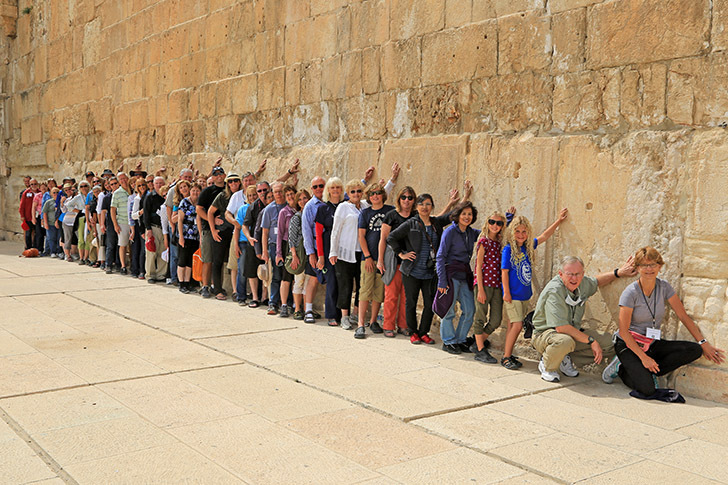 April 24 – Day 12 –Tuesday – Our last day in the Holy Land is the highlight of the tour. We start at the top of the Mt. of Olives and then walk down the route Jesus may have come on his last week. We have a special meeting in the Garden of Gethsemane and see olive trees that are at least a thousand years old. Then we visit the Orson Hyde gardens and talk about the dedication of Israel for the gathering of the Jews. Next, we visit the Upper Room, believed to have been built on the site of the Last Supper, then move to the Church of St. Peter in Gallicantu, built on Caiaphas’s palace where Jesus was tried. Our tour is capped with a visit to the Garden Tomb where we will remember that “He is not here for he has risen.” Here will have a final testimony meeting. We end with a feast together and go on to the airport. April 25 – Day 13 – Wednesday – Trans-Atlantic flight and arrive home. The cost of the Holy Land portion of the trip is $2,629. Meeting & assistance on arrival at Amman and departure at Ben-Gurion Airport by Amiel Tours representative, and local Jordan representative. Entrance fees to the following sites and museums: Petra, Jeep in Wadi Rum (2 hours), Masada by gondola, Qumran, Beit Shean, Banias, Boat ride on the Sea of Galilee, ancient boat museum, Mt. Arbel, Nazareth Village, Caesarea, Israel Museum, Yad Vashem, City of David include Archeological experience, Davidson center. All relevant churches in Galilee and Jerusalem. Our rate excludes: Expenses of a personal nature; meals and drinks other than mentioned above; R/T Airfare (Block pricing may be obtained from SLC) and travel insurance. Call or email Sarah Wangsgard at Morris Murdock Travel for more information on this trip or to book your $500 deposit per person today. Places will go quickly. 801-483-6473. Email Sarah by clicking here. We do this tour just one time a year and we would love to have you can join us! I went on this tour in 2017, and it was the most thrilling, life-changing travel experience I have ever had in my 70 years on this earth. The Proctors' grasp of history in this part of the world, both secular and profane, is deep and broad. And their ability to tie it to significant gospel themes, and especially to the life of the Savior, is unparalleled. So many times the Spirit spoke during this trip. So many times a place, an event, and the accompanying dialog reduced me to tears. How grateful I was for this incredible tour.